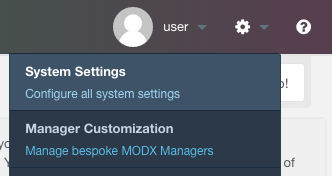 You can modify the mail settings in the “System Settings” menu, as shown in the images below. SMTP Connection Prefix: "ssl" or "tls"
SMTP Hosts: your email provider host. SMTP Port: your email provider port. SMTP User: your email user. To test your email settings, you can install the “Quick Email” plugin. Once it is installed, go to the home page, add “!QuickEmail? &debug=`1`” to the page content, and save the page. Once you browse to the home page, the plugin will try to send an email with the one you provided during the installation. This address can be modified by clicking on the user name at the top right corner of the dashboard. To configure the application to use other third-party SMTP services for outgoing email, such as SendGrid, refer to the FAQ. NOTE: If you are using Gmail as the outbound email server, your application’s attempts to send outgoing emails may be blocked by Gmail if it considers the authentication attempts to be suspicious. When this happens, you will receive a Gmail security alert at the corresponding Gmail address. To proceed, you will need to manually confirm the validity of the authentication attempt before Gmail will permit the application to send outbound emails. For more information on this and other Gmail issues related to outbound email from your application, refer to our Gmail SMTP troubleshooting page.